A Grove of the Future for Florida? In Florida, a new smart growth strategy called “Grove of the Future” is being looked at which seeks to balance the need for both urban spaces and working agriculture lands by combining the two in a way that enhances them both. Following is a guest post on the concept. More values can be realized from ag land than just growing crops if things are designed differently. The idea is to use part of the land for production of crops, but also include design features that would enhance other values. We need windbreaks for control of citrus bacterial canker, for example, so the windbreak trees could become part of buffers around the crop that also provide biodiversity, habitat, storm water attenuation, and recreational opportunities. There are currently incentives for landowners to devote part of their land to non-crop uses such as cost-share programs and potential revenue for storm water storage and treatment. If additional incentives are added, such as recreational user fees, tax breaks, etc., the idea becomes more economically feasible and realistic. If ag lands designed along these lines are situated adjacent or near urban areas, mutual values can be enhanced. The easier it is for people to access and enjoy the open space and fresh air of rural lands, the more value it would have. And, again with proper design, ag lands could attenuate and treat storm water from urban areas, which would add more value to the ag lands, and work better than digging lakes, which is an “Open Space” use that has a siren call for developers because it’s easy. But, you can’t grow food in the middle of a lake, and the habitat value is less than a shallow wetland. If treated wastewater is used to irrigate the ag lands, disposal costs would be lower and growers would save money on fertilizer and use less water for irrigation, freeing up supplies for urban or industrial uses. The closer the ag lands are to the urban areas that are generating the storm water, the shorter the pipe runs and lower the pumping costs. To capitalize on the value that urban residents can bring to ag, farmers need houses in the general vicinity of their fields. And, to capitalize on a lifestyle that involves less driving and is healthier, urban areas need rural lands nearby. So, the values and benefits will depend largely on the way the landscape is designed. The successful achievement of the “Grove of the Future”, and “Town of the Future”, hinges entirely on design. Things have to be designed right to function in the way that is visualized. It has to be more than numbers and formulas – the design parameters must be specified. 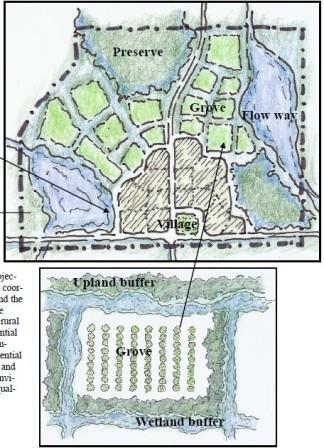 The illustration (above) shows how the “Green Space” can be designed with the same level of detail that is included now with urban design. If the designs of the two are combined, both will be better – and more profitable for everybody, including the County. Why not give it a try? It’ll mean thinking about alternatives that may, when you first hear them, sound impossible and ridiculous. But, as you can see by these grove design ideas, if it is possible to design every acre of ag land in a way that we will have food to eat, crops to sell, higher profits for farmers, and provide places for people to interact with their living environment in healthy, enjoyable, and affordable ways — maybe it’s not so crazy after all. It is possible and probably will happen at some point as we continue to wean ourselves from sprawl development patterns. Why not now? About the Author: Pete Spyke is a native Floridian and third generation citrus grower. Pete and his wife Cindy operate Arapaho Citrus Management (ArapahoCitrus.com), a farming company in Ft. Pierce, and The Orange Shop (FloridaOrangeShop.com), a gift fruit shipping company in Citra, FL. He has been involved for many years as a volunteer and consultant in the development of rural land strategies for Growth Management initiatives for governments in Florid. Pete and Cindy recently received the 2010 Florida Ag-Environmental Leadership Award from Commissioner of Agriculture Charles Bronson. This entry was posted in Agriculture and Environment, Farmland Protection, Local Farms and Food, Water Quality and tagged agriculture land, Citrus Grove, Florida, green space on November 10, 2010 by admin.